Below you will read a real story of a fellow Doncaster resident, a family struggle and the will to fight with every breath to make some lasting memories. The below story is an example of who we help with our work and who YOU help with your support. 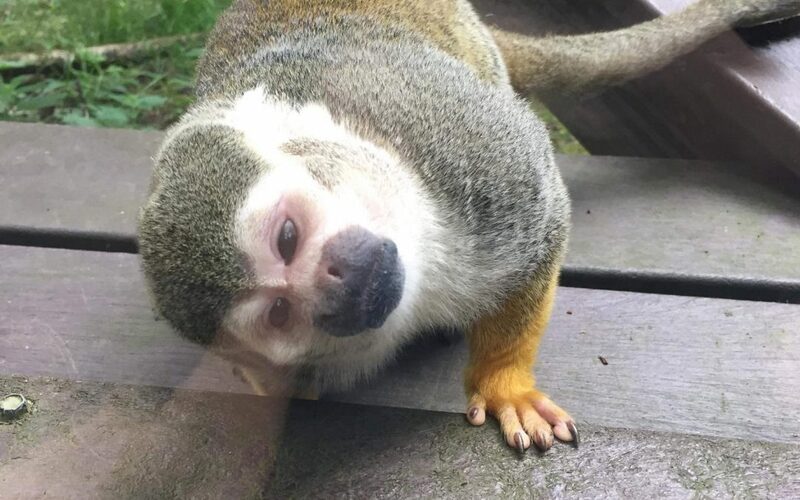 In this Dream we sent the family to “Monkey World”, to share new experiences, to briefly forget their struggles and do something a little different, as a family. Please read the story below about this local family and know, your donations and support make a real difference for real, local, people. In July 2017 I had a routine appointment to see my GP as I had been suffering with hot flushes and suspected I was going through an early menopause as both my mum and grandma had, as a busy working mum and nanny I was never ill and never really had time to be ill and I wasn’t too concerned about the flushes as they were more of an inconvenience than an illness. Our eldest daughter had gone abroad on holiday with her partner on the Monday of that week and me and marc were looking after Louis. My GP referred me for a few more tests that week, again I wasn’t overly concerned, I presumed that as well as going through the menopause I was probably tired, and a bit run down ready for a holiday, as most working mums feel sometimes. After attending the hospital for an abdominal scan, I returned home to have quite a few missed calls from my GP, he explained that the scan had shown a darker area in my uterus and my liver, he couldn’t explain in any further detail until furthermore in-depth scans had been done and he wanted me to attend the hospital the following week for more tests. He told me that he didn’t want to alarm me, but this had to be treated as very serious. Everything then became very scary, without having any idea of what was maybe wrong and trying not to jump to conclusions. We went off on holiday and what was probably the hardest week we had ever had we were kept hopeful and happy by the two little ones our son Tommy and grandson Louis who were both oblivious to what me Marc, our older children Laura and Grant and our family at home were going through. On the Monday of our return I was asked to go for a pre-op where all the usual checks including blood tests were done, I was called that evening and asked to attend the following day to see a consultant. Marc and I attended the following day and were told that cancer had been detected in my blood and that I would be having the scans and all other tests that week, my case had been looked at by the MDT team and they had decided that the gynaecology department would be leading. The week passed by with all sorts of appointments including a biopsy of the growth in my cervix and we were asked to return the following week. On our return it was confirmed that I had grade 4 cervical cancer with a secondary tumour in my liver, It was inoperable and I was terminally ill. I was offered an intensive course of chemotherapy with the intent of trying to shrink both tumours and manage any pain and symptoms, I think then my mind shut down, I could not accept this or even think about it, let alone try to explain to my family and children. I was asked to read through the side effects of the treatment and make a decision if I wanted to go ahead with the chemo, I was to return the following week once everything had sunk in, I only remember this as very hazy as I couldn’t listen to anymore I didn’t want to hear the doctor’s words, I just had to get out of there. I said I was leaving and my husband stayed on to talk to the specialist. I remember returning home and my mum and sisters were gathered with our children all waiting, all hoping, all praying for the good news that we never had. I decided I would take anything and everything that they could offer me, no matter what the side effects were, I also made the decision that I only wanted to know what I already knew, I did not want more details, I did not want to know any life expectancy times or what to expect once treatment had finished or when it would finish, I would do this one day at a time, I could not give any answers to my families questions if I never had any to give, I was going to remain positive and fight with everything I had got. I started chemo the following week at Weston Park Hospital in Sheffield, the treatment would be every 3 weeks for around 7 hours, the side effects have not been nice, and my life and families’ life have changed dramatically. I am unable to do a lot of things I previously took for granted and I have had to give up my job which I loved. I was always a very strong independent woman who juggled a job, housework and child care, with my husband’s input of course, but now I must rely on my husband very heavily, he has had to take over everything as well as holding down a full-time job and providing for us. He is absolutely fantastic and my rock! That’s not forgetting our children and my family who are also very supportive and helpful, which I really appreciate. I have now just had dose 9 of my chemo, which is good going as the expected dose is between 4 and 6 with the strength I am having, the side effects are getting worse and it is taking longer to recover each time, I suffered a bad reaction last time and went into anaphylactic shock whilst having treatment which was not a very nice experience, I see my consultant next week to see what the next step is. Would you like to help us make Dreams like these come true? Please consider a donation, however small.